Well, are they or aren't they? There are always going to be at least a few albums whose Mellotron content is uncertain; it may be, but then... Every now and again, these can be verified one way or the other, but there's bound to be a few that always remain a mystery. Many of those below have been removed from the regular reviews pages, and will stay here until/if more information is received. East of Eden (name taken from the Steinbeck book/film, of course) are best-known for their unrepresentative one-off UK hit, Jig-a-Jig, but it seems there was considerably more to the band than that. Formed in 1967, their debut, Mercator Projected, is an excellent electric violin-driven post-psych album with loads of energy and great tunes. They weren't afraid to experiment and stretch out, but there was obviously something about them that didn't really gel with the British scene, as they ended up concentrating on Europe, where they actually had a career. 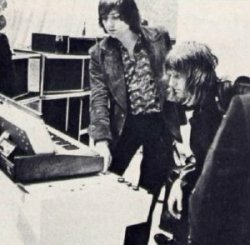 I'm told there's Mellotron on Mercator Projected (player unknown, as no-one's credited with keys), but even though the monophonic string line on Bathers sounds a lot like an effected MkII, it could just as easily be effected electric violin; the few times two notes are played at once are the giveaway, as it stops sounding like a 'Tron and starts sounding like a solo violin. HOWEVER... without finding out from someone who actually knows, it's almost impossible to say, as it could easily be a 'Tron doubling the violin line; the sound is certainly thick enough, but then it could be the violin double-tracked... As a result, this stays here until/if I find out more. It's a damn' good album either way - worth hearing for fans of the era. Something interesting/amusing I noticed is that the band's drummer at the time, Dave Dufort (or 'Dufont' as it says here) went on to drum with NWOBHM stalwarts Angel Witch a decade later, although he didn't play on their sole major-label release. Well, they had to get in here eventually, didn't they? 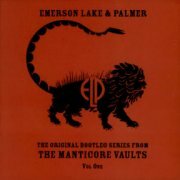 Regular readers of this site may possibly have gleaned that I'm not ELP's biggest fan; along with Yes (possibly unfairly in the case of the latter), they're chiefly responsible for the terrible name prog's had ever since punk, er, thirty-five bloody years now... In ELP's case I can actually see their detractors' point; the sainted John Peel, upon seeing their first gig at the 1970 Isle of Wight Festival (start as you mean to go on, eh? ), brilliantly described them as, "A tragic waste of talent and electricity", although the band have had the last laugh by outliving him. I've also heard them called 'the nouveaux riche of prog': brash, tasteless show-offs who just have to fling their raw talent around without a thought for where it might land or what harm it might do. Of course, millions of you will strongly disagree with me; you're entitled, just as I'm entitled to my somewhat heretical view, in the eyes of the prog faithful. D'you know, were it not for that pic (apologies to whoever I ripped it off from, incidentally, whoever you are), I'd seriously doubt the veracity of the whole story, but when you actually see Greg with that set-up behind him, things begin to fall into place. Incidentally, the gig dates from before the album's release (April 21st, at Louisville Town Hall, Kentucky, to be exact, some boots actually titled Abaddon's Bolero), so maybe the whole thing's complete pie in the sky and they just tackled it as best they could, the Mellotron story dating from later that year. A good bootleg listings site tells me that they played the full-length piece (as against a truncated version played the following year) at Brighton that November, so maybe the story originates there? If I get to hear that one, I'll come back and let you know. [A few years later] More news! 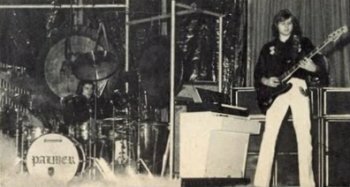 Here is quite indisputable proof that Greg played Mellotron on stage, at least briefly. Someone's synched up a bootleg recording of Abaddon's Bolero from, I believe, Zürich's Hallenstadion on April 15th 1973 with some single-camera colour footage, possibly shot by a local TV station. He appears to be playing single notes on the familiar strings (so much for the 'pre-recorded phrases'), with bass notes on the MiniMoog sitting on top. And given their usual excessive expenditure, was it really asking too much to put the whole lot on a low riser, so Greg didn't have to risk backache while playing? Anyway, this gig doesn't appear to've been made officially available, so until/unless it is, this lengthy screed will have to stay here. The Grapes of Wrath were a Canadian powerpop band, operating at the folky end of the spectrum; 1991's These Days was their fourth album and last before their split (they reformed in 2000 and recorded a sixth record). Apparently, it didn't go down that well with their fanbase, although it sounds like a perfectly good folky pop/rock release to me, the gorgeous electric 12-string on Days bringing The Byrds to mind, although they shamelessly rip Zep's Rain Song on I Can't Find My Home. Naughty. Now, I've had this on the site as an 'unconfirmed' just about forever and now I hear it, I'm no better off. Unlike many similar, I can't find any references to Mellotron use (although something must have made me put it on here in the first place) and the strings on You May Be Right and flutes on the lengthy Miracle are somewhat inconclusive. The only people involved with the recording who have anything to do with Mellotrons are members of XTC, credited as The Dukes of Stratosphear, who play, er, something on A Fishing Tale, but certainly not Mellotron. As a result, this stays here until/if I should find out anything more useful. So; a reasonably good album with some very good moments, but the jury's out on its Mellotron content. The New Order story is far too familiar to bear any serious repetition; suffice to say, they are essentially the regrouped Joy Division after that band's dissolution following the suicide of vocalist Ian Curtis. New Order have kept a foot in both the indie and dance camps, frequently mixing the two, or producing innovative dance-based material such as 1983's excellent Blue Monday (and no, the choirs on that track are absolutely not Mellotron). 1) It's a generic late-'80s grungy string sample that sounds slightly like Mellotron strings 'cos they're, duh, grungy string samples. 2) It's an early Mellotron sample. Option 1) would get it disqualified from this site, or at the very best, exiled to Mistaken ID, option 2) gets it stuck in Samples, and option 3) doesn't actually seem that likely, so this is going to live here until I can prove which option it falls under. Anyway, is it a good album? Actually, yes; although I'm not exactly a fan of their thang, this is a pleasant listen with some reasonably groundbreaking material. And a remake of Blue Monday. Odissea's sole release is an above-average slice of typical Italian prog, although at times it sounds just that little bit to close to Genesis for comfort. Strangely, I've seen Odissea described as 'average', but I've heard an awful lot more ordinary albums within the genre, although it has to be borne in mind that the quality of early-'70s Italian progressive was way above that of most countries. You may have noted that although this album is in 'possibles' rather than 'mistaken identity', none of the tracks above have been highlighted; I was working from an inaccurate tracklisting, and since none of the tracks definitely contain Mellotron, time constraints stop me going back to check, at least this week. Most of the strings are, in fact, clearly uncredited string synth, but every now and again, there's the odd note or background chord sequence that just might actually be Ennio Cinguino's credited 'Tron, though I have no idea how I'd find out for sure over 30 years down the line. Anyway, a good album, though not one of the greats, but some deeply suspect 'Mellotron'. Your choice.